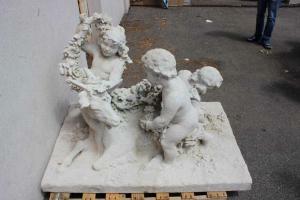 Pair of limestone figural groups, one signed by H. (Henri Leon) Greber (Fla., 19th/20th c.) (est. $8,000-$12,000). Oil on canvas attributed to Samuel Walters (British, 1811-1882), titled Mary Moore (est. $1,500-$3,000). 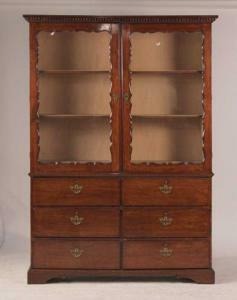 Mid-18th century English George II mahogany wall cabinet in two parts, 6 feet 8 inches tall (est. $1,500-$3,000). Tiffany Studios cast bronze crab inkwell with an oyster shell lid, stamped and numbered (est. $5,000-$10,000). 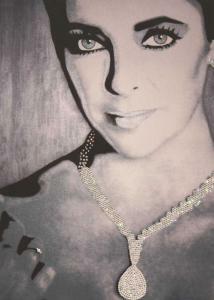 Artist proof lithograph of Liz Taylor by Sylvia Robert, mounted with crystals, signed and numbered (est. $400-$600). The sale will featuring property from the Westervelt Corporation, the NAMITS Collection and several private collections out of Long Island, New York. BLOOMFIELD, N.J., UNITED STATES, September 14, 2018 /EINPresswire.com/ — BLOOMFIELD, N.J. – Nye & Company Auctioneers’ Estate Treasures Sale on Tuesday, Sept. 25th, will showcase a broad and diverse group of fine and decorative arts, featuring property from the Westervelt Corporation, the NAMITS Collection and several private collections from Long Island. The auction will be held online and in Nye’s gallery, at 20 Beach Street in Bloomfield. In all, 600 total lots will come up for bid, starting promptly at 10 am Eastern time. For those unable to attend in person, internet bidding will be facilitated by LiveAuctioneers.com and Invaluable.com. People can bid in person, over the phone, in absentia and online. Previews will be held weekdays, from 10-4 Eastern, as well as on Sunday, September 23rd, from noon to 4 pm. A pair of limestone figural groups, one signed by H. (Henri Leon) Greber (Fl., 19th/20th c) and, according to tradition, commissioned in 1905 by the landscape architects Guy Lowell and Charles Singer Sargeant for the 500-acre garden of Harbor Hill, an estate home in Roslyn, Long Island, should bring $8,000-$12,000. The home was designed by Stanford White for Clarence Hungerford Mackay, a Wall Street financier. The figures are 41 inches tall and 57 inches wide. An Italian carved marble well head, circa the 19th century, 37 inches tall by 30 inches wide, has an estimate of $7,000-$10,000. 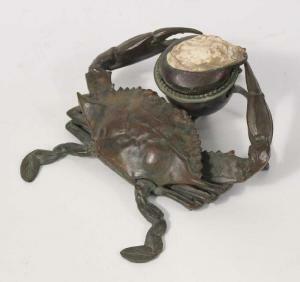 Also, a Tiffany Studios cast bronze crab inkwell with an oyster shell lid, stamped and numbered and showing an early Tiffany company logo, is expected to command $5,000-$10,000; and a late 19th century American cast-iron architectural element depicting Diana the Huntress, on a later stand, 28 ½ inches tall, should sell for $1,500-$3,000. The maritime art will feature a late 19th or early 20th century American cased diorama of a shipyard, 5 feet 5 inches long and 19 ½ inches wide ($3,000-$5,000); a carved maple figural sculpture of three sailors, by Adlai S. Hardin (1901-1989), 37 inches tall by 45 inches wide (est. $1,500-$3,000); and a late 19th or early 20th century cased hull model of the Scottish ship Dechmont, mounted on a metal stand, 54 inches tall by 79 ¾ inches wide (est. $2,000-$4,000). Maritime art of the two-dimensional variety will feature an oil on canvas painting attributed to Samuel Walters (British, 1811-1882), titled Mary Moore, measuring 33 ½ inches by 51 ½ inches (est. $1,500-$3,000). Walters was one of the brightest lights of the Liverpool School of marine art. He excelled in all facets of marine painting, but was most accomplished in ship portraiture. A highly detailed 19th century model of an Asian man selling baskets, with additional baskets and displays, 24 ½ inches tall by 26 ½ inches wide (est. $300-$500); while an artist proof lithograph of Liz Taylor by Sylvia Robert, mounted with crystals and signed and numbered (“Robert / D&D / 3/50”) on verso, measuring 38 ½ inches by 27 ½ inches (est. $400-$600). The furniture category will be led by a mid-18th century English George II mahogany wall cabinet in two parts, having upper drawers fitted with cutlery dividers, 6 feet 8 inches tall by (est. $1,500-$3,000); a late 20th century American walnut platform bed with inset grass Tatami mats, attributed to Mira Nakashima, 6 feet in width by 7 feet 5 inches in length (est. $1,000-$2,000); and a late 18th century French or Italian Neoclassical parquetry commode (est. $3,000-$5,000). For more information about Nye & Company Auctioneers and the upcoming auction slated for September 25th, please visit www.nyeandcompany.com. The full color catalog is available for viewing at www.nyeandcompany.com, www.LiveAuctioneers.com and www.Invaluable.com.